The first page kicks off with a narration from an as yet unseen Autobot. He talks of the conflict between the Autobots and Decepticons and the differing tactics. The Autobots trying to conserve energon, the Decepticons engaging in attacks with wild abandon. He sent one of his soldiers to investigate and has heard nothing, so instead of holding the line he’s looking for answers. 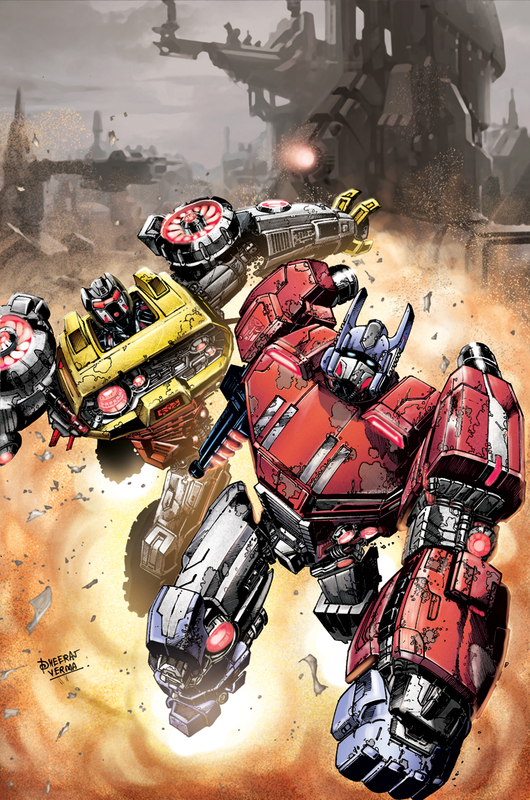 Next page tells us it’s Grimlock and accompanying him is Sludge, Snarl and Slag (although he is refered to as Slug at one point – typo, or something else we’ve yet to establish) they don’t refer to themselves as Dinobots, Dynabots but simply as the Lightning Strike Coalition. They get torn into the Decepticons while Grimlock narrates and establishes the characters including himself. Cut to Iacon and Perceptor is watching the battlefields when both Optimus Prime and Jazz appear. It turns our Grimlock’s efforts are tearing into the Decepticon lines too successfully and this is in danger of upsetting the long view. Prime barks orders at him to fall back, Grimlock wants to disobey but in the end accedes. He has a bit of an angry exchange with Prime before stalking off. Prime’s reason for the energon conservation is to ensure that the Ark can be built and launched. Grimlock is angry, but before he can rant he gets a secure message from Swoop who has discovered the Decepticons plans and where the energon is coming from. Before he can go into detail the transmission is cut off. Grimlock then says they will go and get him. 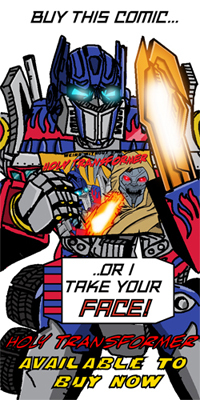 The first thing to notice, is this isn’t the me Grimlock version, none of the strangled speech patterns. This is the surly, almost mean spirited version from the early days of Bob Budiansky and Simon Furman. Though John Barber does capture the on high version of Optimus against the down and dirty Grimlock conflict we’ve had before. The story while tying into the Transformers games, could just as easily sit within the Marvel continuity without any changes needing to be made. Future installments may make that a lie, but right now it fits snugly. The art is detailed and the inks a little scratchy in places, these machines have been in combat, their is damage, wear and tear and pock marks. Details that really make it for me. It might not be to everyone’s tastes, it feels like a more modern Will Simpson although a little more angular and detailed. The colouring is good, although looking at it, I think it needed a more muted and flatter palette to really make the lineart zing. It’s a decent comic, although on first read I was not all that impressed, but re-reading it a couple of times ensured that I enjoyed it more. Certainly it’s a cut above a lot of game tie-in comics out there.